Welcome to Grupo Preto Velho Capoeira Angola. 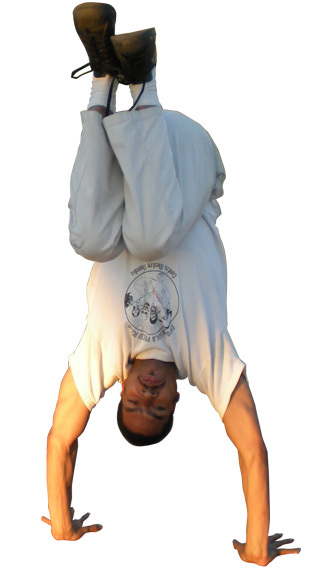 Our school is dedicated to teaching, preserving, and celebrating the martial art of capoeira. Capoeira is an African martial art. Enslaved Africans carried capoeira with them when they were brought to Brazil. The art has been developing there, and around the world, for at least four centuries. Mestre Themba and his students founded Preto Velho in West Oakland in the early 80s. Since then, Preto Velho has been committed to the serious study of capoeira’s movements and music. Capoeira angola has deep, rich traditions. We are thankful to our ancestors, and we honor our lineage of great teachers by also passing on the knowledge, ethics and humanism that are keys to the art. We believe that capoeira comes from and belongs to the community. At Preto Velho, we look out for, respect, and take care of one another. Our doors are always open to anyone who wants to come and learn this beautiful blend of dance, music, and movement. Capoeira is good health for the body and soul. Posted on 01.02.10	to . Grab the feed. No comments yet. Add your thoughts or trackback from your own site.